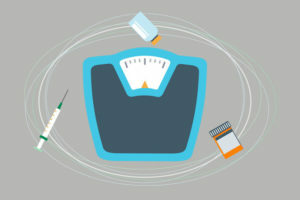 Medications that lower blood sugar levels in people with type 2 diabetes can make it hard to lose weight. Fortunately, some newer anti-diabetes medications make weight loss easier. Endocrinologist Betul Hatipoglu, MD, offers suggestions. If you have type 2 diabetes (T2D), there’s a good chance you are overweight or obese. It’s also likely your doctor has told you that you need to lose weight in order to regulate your blood sugar. But no matter how hard you try, the pounds don’t budge. Your diabetes medication may be the problem. “I hate to give my patients these medications. I tell them to lose weight, and then I write a prescription that increases their appetite or makes them gain weight. It’s like shooting them in the foot,” says endocrinologist Betul Hatipoglu, MD. Make changes gradually. Overhauling your lifestyle is an overwhelming task that can be made easier by doing it gradually. For example, stop eating bread or drinking sugary sodas. Start eating a healthy breakfast. Exercise 10 minutes a day. “Adopt a healthy behavior you can live with, and add more changes as you are able,” Dr. Hatipoglu advises. Try a low-carb diet. Insulin resistance makes your body think it’s starving, so it won’t let go of fat. A low-carb diet can break your body’s obsession with fat. When you stop eating carbs, your body will draw down its fat stores. You won’t need to give up carbs forever. Once you start losing weight, you can reintroduce whole grains gradually to see how many carbs you can eat without gaining weight. Move it. Move as much as you can. Exercise of any kind speeds up the metabolism and accelerates weight loss. Seek support. If your doctor is associated with a medical center, find out if there is a diabetes management or weight-loss program you can tap into. If not, check the website of the pharmaceutical company that makes your diabetes drug, since many companies have patient support programs. Consider bariatric surgery. If you continue to struggle with your weight, consider consulting a bariatric surgeon. A weight-loss surgical procedure might be your ticket to success. “There is good evidence that the loss of weight patients experience from these procedures can not only reverse their diabetes, but reduce their risk from its complications,” says Dr. Hatipoglu. Some newer diabetes medications don’t cause weight gain — or will at least allow patients to lose weight. These drugs — liraglutide (Victoza®) and empagliflozin (Jardiance®) — are also beneficial to the heart. If you are taking a different diabetes medication and struggling to lose weight, ask your doctor if one of these might be right for you. Be sure to check with your insurance plan to ensure the cost will be covered. According to Dr. Hatipoglu, some patients find that even when they take one of these newer diabetes medications, they need an extra push to jump start the weight loss process. In these cases, she is not opposed to prescribing weight-loss drugs for short-term use. “They don’t replace diet and exercise, but they offer the little push that many patients need to lose weight,” she says. Obesity is a major risk factor for the development of insulin resistance, which can lead to type 2 diabetes. People ages 51 to 61 with diabetes have a mortality rate 2.6 times higher than their peers without diabetes. Add obesity to the mix, and the mortality rate jumps to 7 times normal. Obesity is also a major obstacle to achieving long-term glycemic control. But weight loss can bring about major changes. In fact, losing only 10 percent of your excess pounds can make diabetes disappear. This article originally appeared in Cleveland Clinic Heart Advisor. Weight-Loss Medications: Are They Right for You?